With its drab, faded, rusty black coloration, rough, mouldering wing texture, and strangely moth-like appearance, this Funereal Duskywing (Erynnis funeralis) proves that not every butterfly is beautiful. 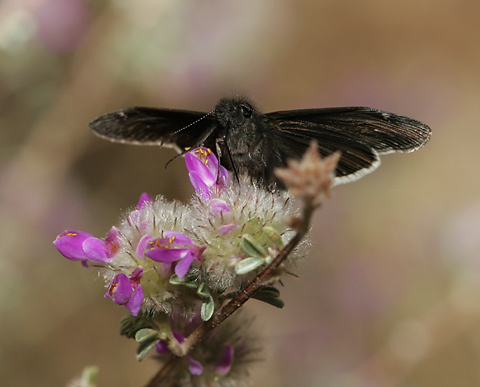 In March of 2007, this and many other Funereal Duskywing butterflies were visiting blooming Santa Catalina Prairie Clovers (Dalea pulchra) in the foothills of the Santa Catalina Mountains near Tucson. 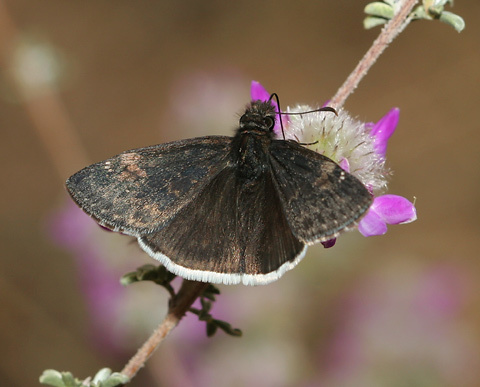 Funereal Duskywing butterflies have brownish black wings with a fringe of white on the edge of the hindwings. There is an arc of usually 3 or 4 tiny, pale spots near a larger, mottled patch of tan on the leading edge of the dorsal forewings. The dorsal forewings are lightly mottled and are faintly dotted along the far edges, while the dorsal hindwings are mostly solidly colored brownish black (except for the white fringe). The ventral wing surfaces are mostly brownish black with a few tiny, pale spots and a slightly paler brown patch at the tips of the ventral forewings (barely visible below). 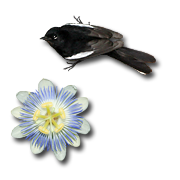 Funereal Duskywings are very similar to other Duskywing butterflies (Erynnis spp. ), but they have longer, narrower forewings and fewer, smaller spots and fainter mottling on their wings. Despite their lack of traditional butterfly beauty, Funereal Duskywings are a true delight to watch as they dart from flower to flower because they are such quick and sprightly fliers. 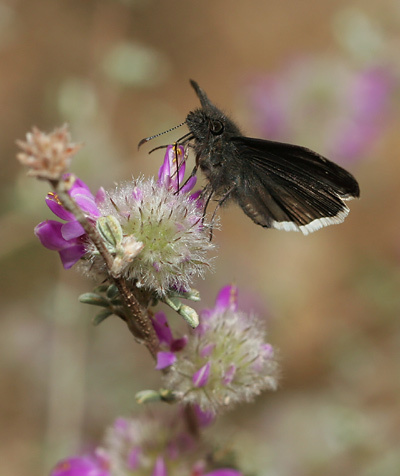 Funereal Duskywings are members of the Skipper Family (Hesperiidae), and butterflies in this family are known not only for their rapid and agile flight, but also for their characteristic fat-bodied, large-eyed, relatively small-winged, moth-like appearance. Even though it's certainly not a beauty contestant in the butterfly world, I think that its plump, furry body and large eyes actually make this drab little Funereal Duskywing butterfly look kind of cute.